George Graham Reviews Sarah McQuaid's "The Plum Tree and the Rose"
The British folk scene, popularized in the late 1960s by Fairport Convention, Steeleye Span, and the Pentangle, continues to attract fans on both sides of the Atlantic. Though we lost two significant figures on the scene in the past couple of years, singer-songwriter John Martyn and Pentangle co-founder Bert Jansch, the scene remains active in folk music circles. This week, we have a fine new album in a kind of archetypal English folk sound, drawing heavily on traditional music, but also including original material. It's by Sarah McQuaid, whose new third recording is called The Plum Tree and the Rose. Interestingly, Sarah McQuaid's last album, released in 2009, was a collection of mainly American Appalachian folk songs, though given a British Isles folk twist. This geographical genre mixing comes naturally to Ms. McQuaid, who was born in Spain, grew up in Chicago, from where she went on tour internationally at age 12 with the Chicago Children's Choir. She spent a year in France in college, and in 1994 moved to Ireland where she worked as a music journalist in Dublin and began to attract audiences through regular television appearances. She released her debut album in 1997. After 13 years in Ireland, she moved to the Cornwall in the West of England, where she continues to live with her husband and two children. Her 2009 CD I Won't Go Home 'Til Morning was inspired by memories of her mother singing her traditional Appalachian folk songs. Her mother had been social worker in the region and took an interest in the folk traditions. But now Ms. McQuaid emphasizes her connections to the Eastern side of the Atlantic on The Plum Tree and the Rose, doing a number of traditional or very old songs, some dating back to the 13th Century, along with a few original pieces. And she performs in a spare acoustic setting with a guitar style very much evocative of the classic English folk sound. It also helps that she has a wonderful alto voice reminiscent of the classic women of the scene, Sandy Denny, Maddy Prior and June Tabor. The CD also has a couple of a cappella vocal pieces, in the form of short musical rounds. She is joined by many of the same musicians who accompanied her on her last album, including Gerry O'Beirne on various sting instruments, Trevor Hutchinson on acoustic bass, and Liam Bradley on percussion. An interesting addition on this album is Bill Blackmore who plays a trumpet or flugelhorn on several tracks -- not exactly an instrument one normally hears in classic English folk, but it adds an distinctive and often attractive texture. Lyrically, the material ranges from contemporary love songs, to song about suitors to the first Queen Elizabeth, to one about coping with tough economic times, along with three songs she wrote to ponder the afterlife. 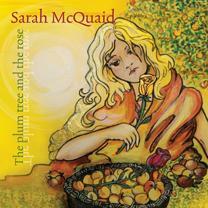 Sarah McQuaid's new third CD The Plum Tree and the Rose is a thoroughly enjoyable album in the classic English folk style. Ms. McQuaid's got the perfect voice for the genre, in the tradition of Sandy Denny, June Tabor or Maddy Prior, though interestingly, minus the British accent. As on her last album, the musical accompaniment is very understated and emphasizes her own fine guitar playing. She is the author of a book on Irish-style guitar by the way. The music is a rather seamless mix of original songs that could pass for traditional with some genuinely centuries-old material. The added musicians are thoroughly tasteful, and even the seemingly anomalous trumpet fits in very well. We'll also give the CD a full grade "A" for sound quality. The acoustic instruments are given a clean natural sound, and Ms. McQuaid's vocal is very nicely captured with a warm sound and just a hint of reverb. Kudos also for the good dynamic range of the recording that let the music ebb and flow in volume. The English folk scene still has a lot of followers, and while many of the artists who popularized the style decades ago are still active, it's great to hear such a fine album by a more contemporary performer with an interesting international and cross-cultural background, carrying on the style and doing it so well.